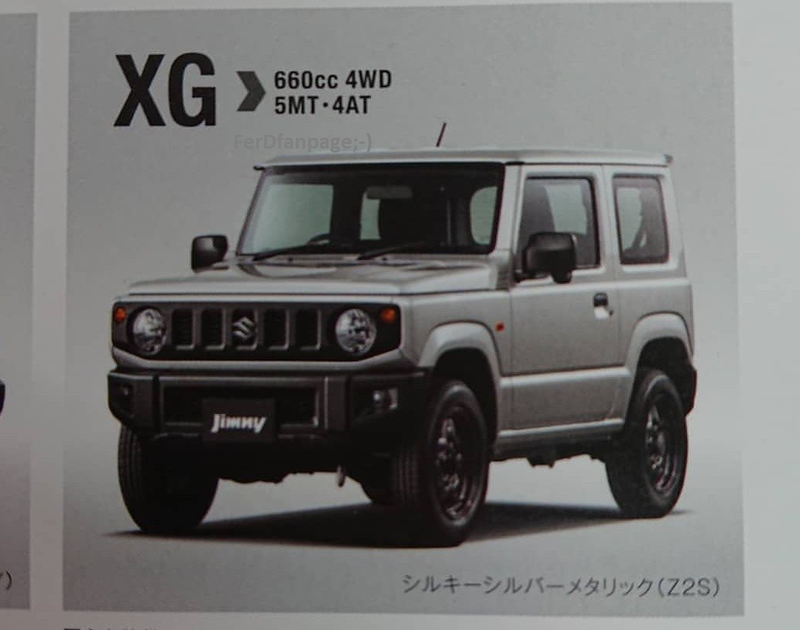 We very well know that the all-new 4th generation Suzuki Jimny is under development for quite some time now. Spy pics of the car have been shared across the web multiple times over past year and a half. As the frequency of these has increased manyfold in the past few months, this hints that the launch is fast approaching. 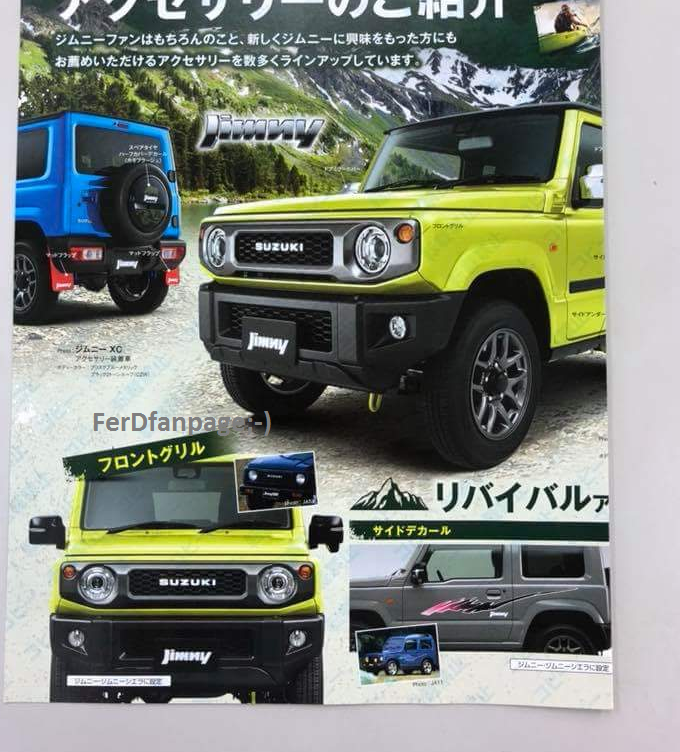 Speculation is that the new Jimny will be unveiled in July 2018. 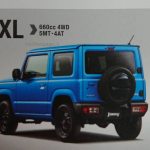 To bolster these hopes, Suzuki showcased a pre-production version of the 4th gen Jimny to select audience in Japan recently. 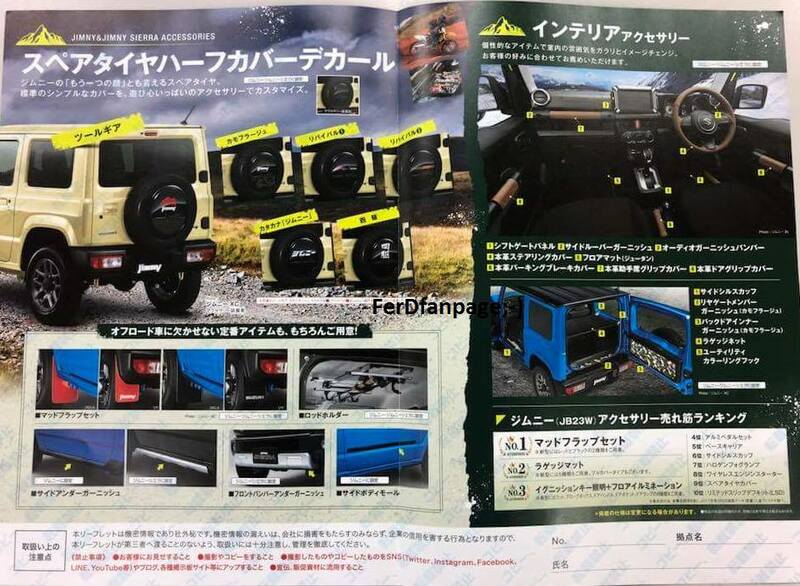 Now, a brochure of the upcoming car has been leaked over the web. With this, we now know some very interesting details about the car. 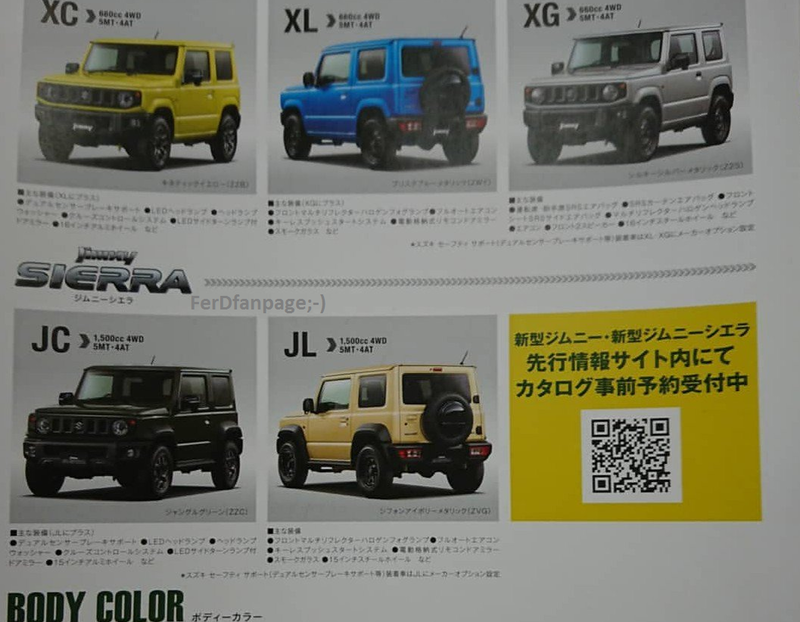 The new Jimny will be available in two formats, Jimny and Jimny Sierra. The Sierra will be the more rugged version of the subcompact offroader with wider tyres, additional body cladding and differently designed alloys. 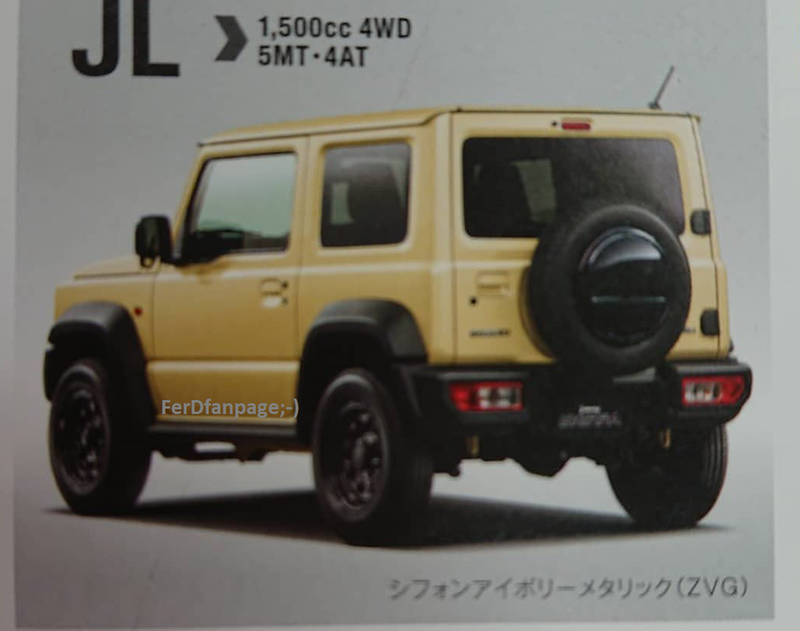 Notably, the design of the new car looks to be somewhat inspired by the G Wagon and has a body on the frame structure. 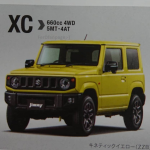 Jimny will be available in 3 variants namely XC, XL & XG while Jimny Sierra will get two trims namely JC & JL. 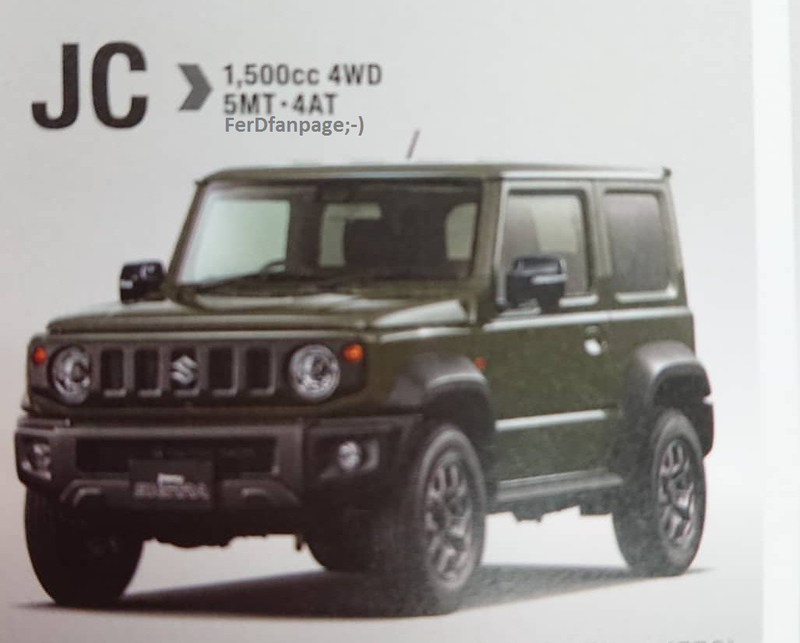 The new design of 4th gen Jimny is a complete departure from the current generation car’s road-biased look. The new car looks more rugged and inspired by the earlier generation models. It carries forward its iconic 5 slat grille design integrated with an all black surround. This grille also houses the round headlights, which are projector units and the round shaped indicators. The car will also feature LED DRLs. 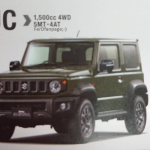 New Jimny will feature all black front and rear bumpers to increase its rugged appeal. The front fog lamps are round in shape as well and are housed in the bumpers. The ORVMs will have integrated indicators and also a blind spot monitoring system, at least, on one version of the car. The overall body design is kept boxy with straight lines and sharp edges. Carrying on this design language forward, the wheel arches are also made more squarish in shape. 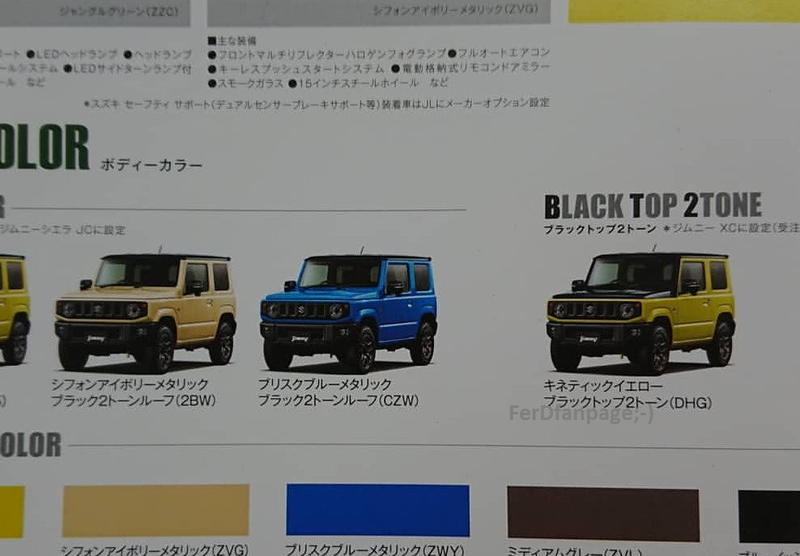 The car will have many elements blacked out like the roof, ORVMs and alloy wheels in addition to the bumpers. This, together with the upright stance and expected off-road capabilities of the car, makes its burly nature more prominent. The interiors of the all-new Jimny will be a mix of contemporary and old style. The most interesting piece of this would be the instrument cluster. 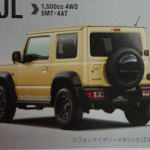 The designers have made an effort to bring in design from the 2nd gen and earlier Jimnys. People who have seen the current Gypsy on offer in India can easily relate to it as the new design is quite similar to it and has remained the same here for nearly 3 decades. 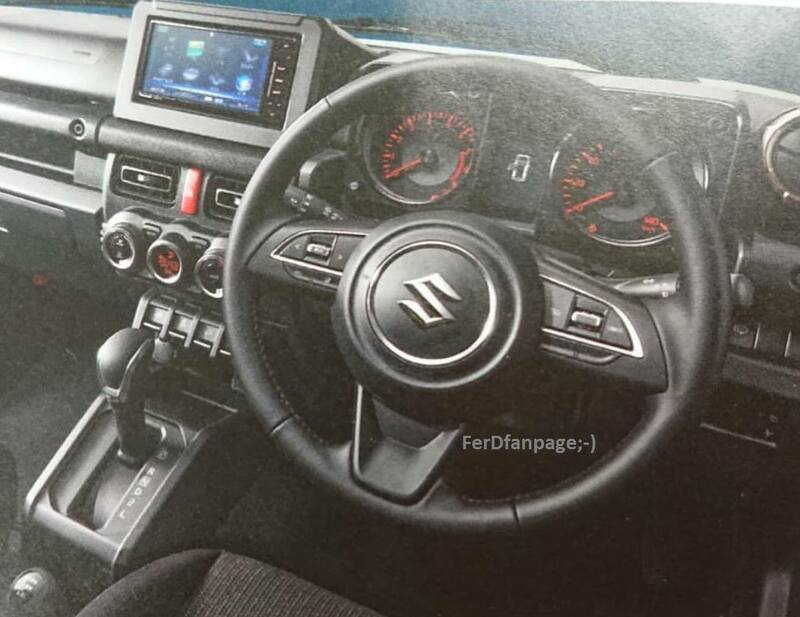 The high set design of the dash, similar to the older gen vehicles, has also made its way to the new car. The dash now features all new AC vents, steering wheel, different buttons and an infotainment system. Many of these features will be shared with other Suzuki models like Ignis, Swift etc. The infotainment system is a first-time addition to the car and is done to keep the product up to speed with the current trends. 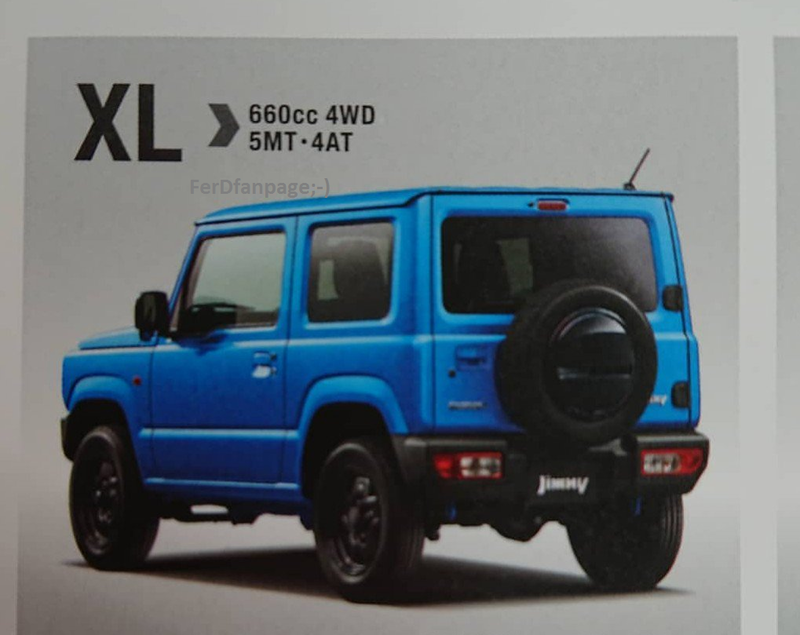 As the brochure suggests, new Jimny will sport a 660cc petrol motor, similar to the current version, while the Jimny Sierra will get the new 1.5 L petrol motor. Notably, this engine appears to be the same as offered on the recently launched Indonesian Ertiga. For the transmission, the car will feature a 5 speed MT and a 4 speed AT. 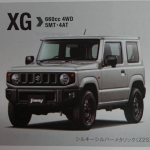 As far as the off-road hardware is concerned, new Jimny will feature a part time four wheel drive system. Though the spied vehicle is a 3 door version of the car, there is a speculation that an extended wheelbase 5 door version will also be on offer at a later stage. The car will be revealed globally in the second half of this year. 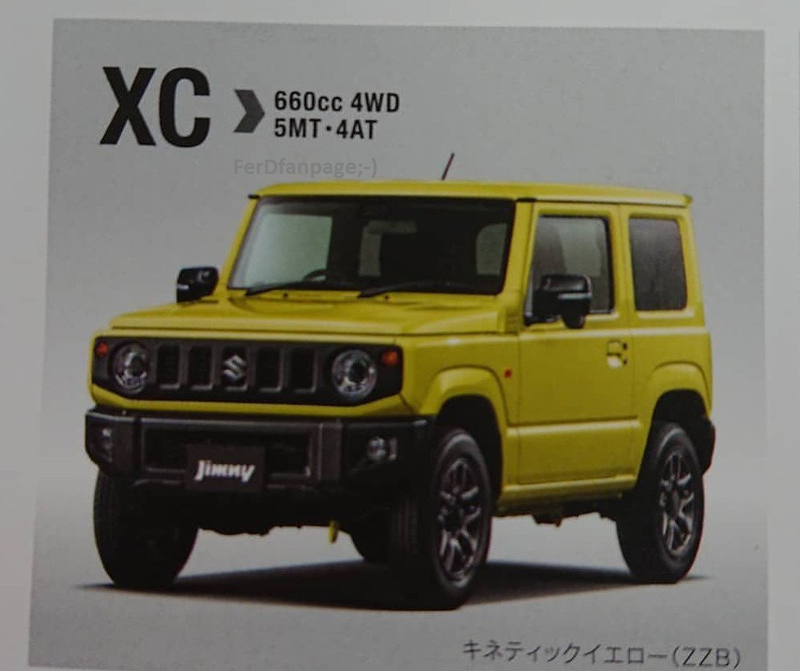 We never got the previous generation Jimny to our shores but, with the increasing interest in lifestyle vehicles in our country, we hope Suzuki will definitely bring it here this time.